Training students by using well-thought-out methods is key if we are to use our time productively and efficiently. Investing time in individuals who will contribute significantly to the realization of the Aims and Proposals of The Venus Project is a priority that we strive for. We aim to create independent educators who will have their teams and activities in their areas which will give this course to others. Applicants go through a selection process intended to select reliable people who will work on optimizing their efforts with respect to time and will assist in providing an environment that encourages teamwork, consistency, and constant improvement by challenging current practices. The average length of the education course is approximately 2 (two) years with a minimum of 5 (five) and a maximum of 10 (ten) hours involvement per week (this varies.) The program is carried out online consequently one of its requirements is that you have a reliable internet connection (most of the time,) microphone, and video camera that we will be using for live internet video discussions. The exercises include Debate, Presenting, and Interviews. Other areas include dissecting all the materials produced by Jacque Fresco and Roxanne Meadows in an attempt to gain a better understanding of this direction. We also attempt to help our potential mentors adopt a lot of these ideas as their own, by going through the material using methods that attempt to reduce biases. 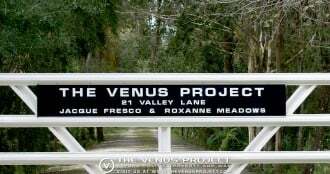 This may seem like a long time, but if you consider the amount of time and effort it took Jacque Fresco to arrive at a Resource Based Economy along with Roxanne Meadows to develop what is today, The Venus Project, spending approximately 2 years of your time to undergo this process is not too much to ask for. The exercises do not require you to finish them at particular times, but if you do not have the time to dedicate you will not finish the course in 2 years. We do understand that there are times that a student might need to place priorities on other activities in their own life, and we encourage this. After passing the selection process, the initial commitment we expect from every participant is to purchase The Complete Venus Project Library Set before they start. Please note that this is a requirement that must be met only after passing the selection process, not before. All purchases support the project financially, and the purchased materials are used for future references within The Sociocyberneering Educational Project. One would most probably need to listen to the materials several times over the length of the course due to the complexity of the subject matter. The Education offered is free, and we do not foresee the need for charging for such a course in the near future. All further activities, after one becomes a educator/mentor, will be financed solely by that person. Having a steady source of income to pay for initial activities such as screenings and rooms for study groups would be very beneficial. In time, once your local group develops or once you have joined other groups active in this area within The Venus Project, you can involve other financial mechanisms such as charity or cost based events. I hope this has provided a clear picture on what we aim to achieve with our Sociocyberneering Educational Project. submit the contact form at the bottom of this page. Must be willing to purchase the complete Venus Project library set before starting the course, after having passed the interview. These will be used for The Sociocyberneering Educational Project students will undertake. Once the student has completed the course, they must be willing to finance initial activities which they might decide to do. A job will be useful for this in order to fund these activities. It is imperative that the potential student has a reliable internet connection, microphone, and a video camera. Any skill set which may be useful to the project at present or in the future will be an advantage to the candidate. The Sociocyberneering Education Project has a selection process which begins when you acknowledge that you meet the requirements described above. Please send your resume along with both your English tests via the form at the bottom. Once the mentor goes through your details, then he will attempt to set up an interview with you online. This is where both you and him determine whether the process is for you or not. Some of the ways you may benefit from this? Improving existing knowledge and gaining new skills, which could be utilized in the current system. If found to be necessary during the course, you will be directed to online education courses which upon completion you could use these certificates in your resume for the current system, thereby enhancing your job application potential. Gaining a way of looking at the world which coincides with the physical world. Example: Identifying mechanisms of human behavior, one of the health benefits to this is it may reduce your daily stress level when dealing with people. Be able to volunteer for the project in a more time efficient manner and with insight. Undergoing a Learning and Teaching process. Be part of a community that plans to offer society a broader spectrum of choices based on the scientific possibilities directed toward a new era of peace and sustainability for all. Through the implementation of a Global Resource Based Economy, and a multitude of innovative and environmentally-friendly technologies directly applied to the social system. These are only some of the benefits that The Sociocyberneering Education Project has for you. Please note that this course is not recognized by the formal education system today. It is not equivalent to anything in today’s education system. Jacque Fresco’s current definition is: Cybernation and Engineering applied to the Social System. The use of this term is an attempt to bring back the original name which was well thought out by Jacque Fresco, because it describes what The Venus Project is about. Submit the form below to apply for the Sociocyberneering Education Project. Do you want to experience The Venus Project live? You have the chance to visit Roxanne Meadows at our Center in Florida. Seminars and Tours are every Saturday. The Venus Project is a part of Resource Based Economy, a 501(c)(3) not-for-profit organization. © 2019 The Venus Project | All rights reserved unless otherwise noted.